Welcome to Week One of the 2017 Fall One Room Challenge™ (ORC). I have 6 weeks to design and renovate a room of my choosing and I’ll be documenting the whole process with you guys! You can find updates every Wednesday here on the blog, as well as sneak peeks and teasers on our Instagram and Facebook pages. Thank you to Linda of Calling it Home, as well as our media sponsor, House Beautiful, for inviting me to be one of the twenty participants in this decorating bonanza. 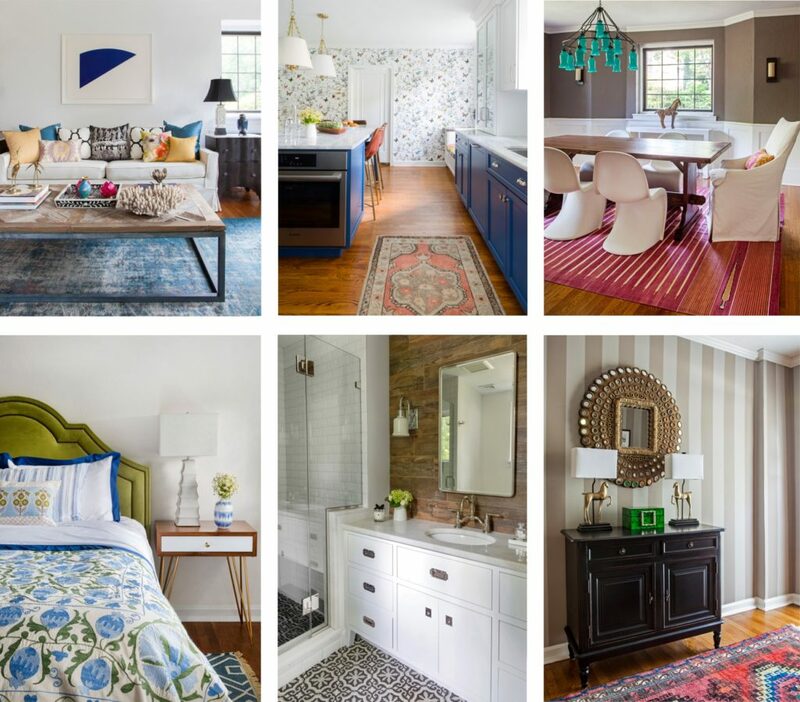 I’ve done the One Room Challenge a lot – six times in all – so today’s launch begins lucky number seven for Design Manifest! If you’d like a quick trip down memory lane through our ORC reveals, please check them out HERE. For those who are new – Hi, I’m Naomi. For the first 12 years of my career, Design Manifest was a father-daughter construction firm. During that time I gained in-depth knowledge about residential renovations from both a technical and aesthetic perspective. My dad, Andrew, retired last year and I have reestablished DM as a full service interior design firm. We partner with select contractors to bring kitchens, bathrooms, and interior design projects to life in the Philadelphia area and beyond. Our team relishes in a good challenge, and we pride ourselves on being exceptional problem solvers, space planners, and creators of stunning atmospheres. In the past, I’ve often chosen to work on my own home projects, but this time we’ll be working on a client’s home – which, as you can imagine, adds to the challenge! The victim, err lucky ORC recipient is my client, D, who was one the very first people to trust me to decorate professionally. We have slowly worked our way through her house, developing a deep trust and synchronicity along the way. It’s been an absolute pleasure to design this home and I’m so proud of the spaces we’ve created so far. Whatever we design next will surely be distinct and beautiful on it own, but it will also need to tie into the rest of the house. For this ORC, we’ve agreed to renovate our client’s guest bedroom and guest bath. Yes, we’re cramming TWO rooms into the One Room Challenge (#overachievers). But seriously, I’m stoked to be making over these spaces. You can be a little more fearless in guest spaces – take a few risks, not take yourself too seriously. As you can see from the images above, my client is not afraid of color or pattern. We plan to have a lot of fun in here, while maintaining traditional character. We will be splurging on a few quality pieces (hello custom walnut sink vanity) and grabbing bargains when we can (like a $300 area rug), because after all, these are the guest spaces and this client, like all of my clients, doesn’t have unlimited funds. There are several challenges in this guest room. One of the more significant is the door situation. There are a total of six doors that really break up the walls and make this space feel disjointed. That, coupled with the bay window, makes this a very awkward room to arrange furniture in. So, we’ll simplify the doors and make the two sets of double closets disappear (you’ll have to wait for this magic trick to reveal itself in later weeks). We’ll also find a bed that commands this room and feels intentional. Our other big challenge in this guest room is the laundry closet. 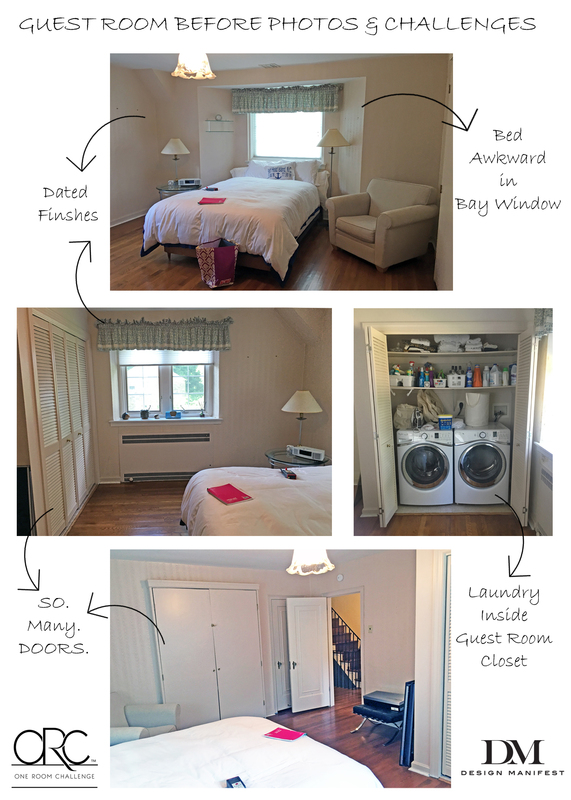 Most days this guest room is acting as a laundry room – with the ironing board and drying rack out. We need to improve the laundry set up. Otherwise, what’s the point of making this guest room pretty if it’s just going to be covered in drying clothes every day? The current layout of this bathroom is narrow, awkward, and it is essentially functioning as a powder room. We’ll rework the floor plan to improve storage, counter space, and flow. We’ll also address the tub & shower (or lack there of). 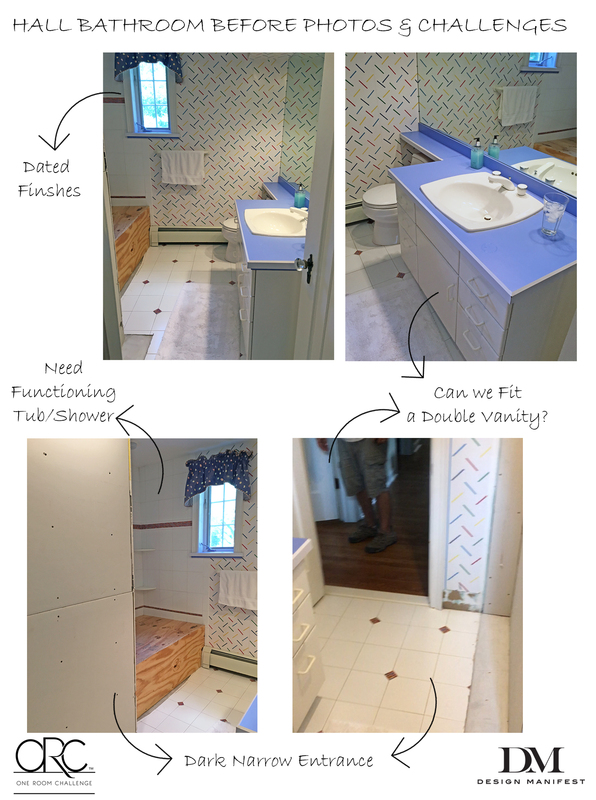 When we renovated the adjacent master bath in this home, we took space from this guest bath to allow for a larger master shower, but made sure to leave enough space for a future renovation. We’ll now take advantage of that forethought by reworking this area to be a functioning bathtub with shower. Then, once we have the layout just right, we’ll bring in updated materials that are more in keeping with the rest of this home. So, as you can see, we seriously have our work cut out for us in the next six weeks! We’re ready to bring our A-Game to bring our client and our readers a phenomenal reveal. As a veteran participant in the ORC, I’ve learned it’s all about the logistics, and yet, even the best laid plans inevitably suffer maladies – from back orders, to human errors, to (presently) delayed building permits that are giving me EXTREME ANXIETY. I’ve never gotten through a single ORC without at least one ugly cry. Luckily I have an amazing team supporting me including our General Contractor Bryan Buono of Buono Construction Group. Thus far he’s been fantastic at working with our tight deadlines and hurry up and wait strategy. We’ll see if he can hang on through the roller coaster turns of the next six weeks! Please say a little prayer for us that the building permit comes in tomorrow, or our bath project may stall out big time. Also – don’t forget to follow along with the progress of my talented ORC featured designers; I’ve listed all 19 of them below. It’s sure to be a whirlwind season of beautiful decorating! Wow! This is going to be a great makeover! Because it can only get better than what it is…..
Oh wow, this is going to be such a rad makeover! Can’t wait to see the transformation, Naomi! So excited to follow along another one of your projects! you’re ORC OG, and stoked to see what you do with this space. Your ORCs are always so amazing, I can’t wait to see you transform these spaces!! Wow, the work you have already done in her home is stunning!! I can’t wait to see how this guest room turns out… Just LOVE the ORC! Hi there! Stopping by through the ORC, and I must say you’ve definitely got your hands full for this challenge! I look forward to following along with the process and seeing the final design in six short weeks! wow that bathroom is so 90s! can’t wait to see what you do with it! I had no idea you needed a permit. UGH! Fingers crossed and I can’t wait to see how this one goes. Client D is so lucky to have you and your dad on board Naomi! Always excited to follow along your ORC! Lucky client! Can’t wait to see how you solve these dilemmas. Will be beautiful! Ah exciting! This being for a client definitely adds to the fun :). It’s going to be a super dramatic transformation, lucky girl! !